Each probation (group preparing for final profession in the Society) is different. Each has its own blend of personalities, nationalities and cultures, of strengths and fragilities, journeys and hopes. The dozen or more women who form community during this amazing, intense and precious time each come at this particular moment in their own lives, and in the life of the world; of the Church, the Society, their own countries. External events interweave with internal dynamics, dreams and perspectives are challenged and widened, and the group grows into its unique character... and, in the process, its unique calls. And all this is somehow gathered up into the name and devise (motto) given to the group towards the end; a name and motto which express their identity and experience, and will serve as a ballast and a call for the rest of their lives. The group who will be professed tomorrow began their process only a month after our General Chapter, in a year already filled with seismic events and a growing tide of greed, violence and prejudice. They end just after the inauguration of Donald Trump, with the tide of ugliness sadly increasing. And during these past five months, true to our charism and mission and the spirit of the Chapter, they heard a call to grow in unity and love, which was summed up by Barbara Dawson, our Superior General, in her closing conference: We saw in action the One Body that you have become, built on trust and lived day in and day out. And we heard over and over again your desire to incarnate God’s love in the midst of people who are poor, exploited and marginalised. And this desire, and the pain and calls of our time, found their response in their name - Drawn by the pierced Heart of Jesus to love - and devise - The Spirit continues to transform us to respond to the needs and cries of our world. This is the call and the intuition each of the probanists has received, at the core of her being; her identity and her mission, not just for these ugly times or a particular place, but throughout her life, wherever she may be. And this, surely, can be a call and a challenge for each of us, as we contemplate the pain and division in our world. To be drawn by the pierced Heart... by a Heart which was wounded, broken open, in a state of utmost vulnerability, and whose response was an outpouring of love... Drawn by this Heart to love... because, as our Constitutions say, The pierced Heart of Jesus opens our being to the depths of God and to the anguish of humankind. 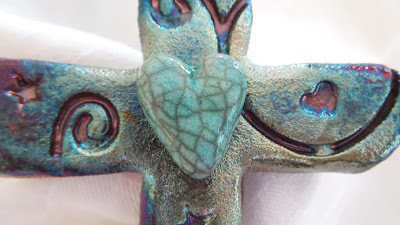 Drawn to love... because, as with the piercing of Jesus' Heart, this opening of our being, of our hearts, opens each of us up to respond with compassion, tenderness and - of course - our own outpouring of love. And drawn because Jesus himself showed us that, however weak and "soft" it may seem, love is in reality the only power strong enough to overcome hate, heal division and create anew. And so we pray with and for the about-to-be professed, as they pledge their response to the Love that has called them. And we can also pray for ourselves, that we too may be drawn by the irresistible power of that same Love, and can make our own these words from the closing conference: God calls us into love, sets us on fire with love for God’s people, and continues to call us into God’s Heart and out to God’s people, like breathing in and breathing out, over and over and over again.